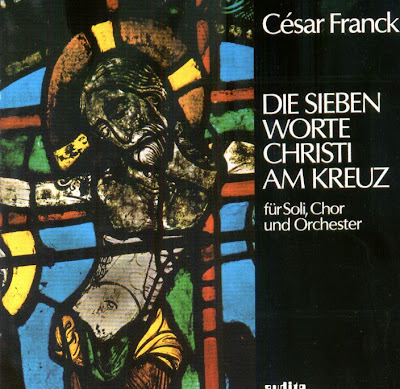 The fact that Franck's liturgical and religious music in the widest sense of the term has become to be dismissed as second-rate in the consciousness of the generations which succeeded him is probably to be attributed to the fact that during the last 15 years of his life - uncontestedly the period of his mature work - he completely turned his back to religiously motivated music of this kind for the sake of chamber and orchestral music, whereas church music was the dominant element in the early and most of all the middle period of his life. One of the most striking compositions of the middle period is The Seven Words Of Christ On The Cross. Completed on August 14, 1859 and without an opus number, the work is puzzling: although a product of care and craftsmanship, it was not performed during the composer's lifetime. In fact, even the writers of music history were unaware of the existence. It was performed for the first time in 1977, i.e. almost 120 years after being written, after Armin Landgraf discovered the autograph in the University Library of Liège while doing research of Franck's church music, it having come into the possession of the library in 1955 after having been in private hands previously. In the course of the music history, the dignity of the text has inspired a number of composers to put these biblical words to music (Schütz, Haydn); yet this did not actually result in the establishment of a genre tradition, i.e. a type of music with a precisely definable function and equally definable demands to be made on the composer. Thus Franck selects a Latin version of the text in which he combines the words of Christ with additional biblical texts and liturgical texts not deriving from the Bible to form larger, self-contained units which are premised by a prologue. Unpretentious in terms of harmonization and intended to be meditative rather than dramatic, the work is nevertheless very powerful, with the composer careful to make sure that the eight movements are combined to form a cyclical structure. In doing so he employs hiw own key symbolism, i.e. he foregoes the use of sharp keys which for him represent light and joy and favours the minor keys. Twice - in the first and the fifth Word - the meditative atmosphere which dominates the piece is interrupted by dramatic elements, whereby elements of the grand-opéra shine trough. The CD was released by AUDITE, 1993 (ADD). audite 95.432. Live recording 21 November 1979 in Heilig-Kreuz-Münster Schwäbisch Gmünd, Germany. (1) Pater, Dimitte Illis (5'39"